I was outside the door for 4pm opening and managed to gain entry a few minutes before that and was soon joined by the rest of our group. I was pleased to be informed that there was so much money in the kitty left over from previous trips that it should cover the costs of the evening. I really like this pub, a good atmosphere with a good friendly atmosphere. I may not have listed all the beers as several were changed during the course of the evening. Mighty Oak - Oscar Wilde Mild 3.70 This came on sale towards the end of our visit but just had to be sampled. Tring - Tryanuary American Amber 4.00 Very much to my taste, I had several of these. This pub opens at 4pm on Fridays so we waited in a nearby pub and arrived here at about 3.58pm to find a fair number of people had beaten us to it and were already sitting with their pints. My first visit here and I really liked it, a comfortable relaxed atmosphere, welcoming staff and a great food selection of either pork pies or Scotch eggs, superb. For the second time today we walk into a pub to find that there is a beer festival underway. Just noting those sampled. New River - Blind Poet 4.50 A dark Porter with chocolate and smoke. Tring - White IPA 5.50 Murky gold. Hoppy and sharp. Evening. Quiet, Monday evening quiet. Good conversation at the bar but little help with my crossword! 16:50 Last stop on the crawl for me. Opened at 16:30 so fairly quiet. Evening until close. Assistant brewer of the in-house brewery was behind the bar. Strathaven - Trumpeter Dark Ale 4.20 Just a taster reminded me of cough linctus, the barman thought of beef gravy! Evening. Pretty much a perfect pub. The beers and customers are equally well looked after. Absolutely no need to go anywhere else in Hertford. Evening. Classy as always, beer clearly cared for. The pork pie was much too good to have taken from Mrs Joe's larder to take to Magwitch! The pub is found in Hertford, Hertfordshire, SG14 1JA. 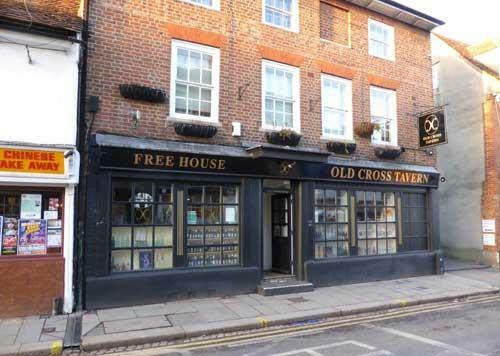 Fairly small freehouse with its own brewery. Around 5-6 beers served, usually one from the brewery and some local and national guests. Has a total of 8 handpumps on the bar but rarely all in use at one time. Local CAMRA branch Pub of the Year 2012 and 2018. We have visited this pub 18 times, seen 50 different beers and tried 26 of them.